Tourism bosses in Cumbria have called for the return of "a crucial piece" of England's highest mountain, which is on display in a London art gallery. The one inch piece of stone was taken from the top of Scafell Pike by artist Oscar Santillan and features in his exhibition at the Copperfield Gallery. Cumbria Tourism said this was "taking the Mickey" and wanted the "top of the mountain" returned. Mr Santillan said he had "not harmed" the landscape. 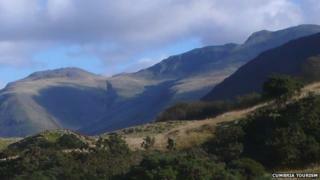 At 978m (3,209ft), Scafell Pike is the highest peak in England. The artist likened his removal of the rock to taking a pebble from a beach. "That is what I have done in making my work 'The Intruder'," he added. Ian Stephens, from Cumbria Tourism, said: ''We are all aware that Cumbria's landscape has long inspired generations of artists, who have all taken a piece of this landscape away in the figurative sense.